FAO said some 1.3 billion tons of food are wasted every year, with the Asia region including China seen as the worst culprit. 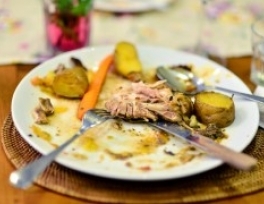 The report said food waste hurts the environment by causing unnecessary carbon emissions, extra water consumption and the reduction of biodiversity as farming takes over more land. The most serious areas of waste are of cereals in Asia and meat in wealthy regions and Latin America. FAO stressed the importance of raising awareness among consumers. “This is a big wake up call. We may not even have captured many of the more indirect impacts of food waste... and the costs which will be born by our children and grandchildren,”he told the joint press-conference. “It will take less than 37 years to add another two billion people to the global population. How on earth will we feed ourselves in the future?”he asked. 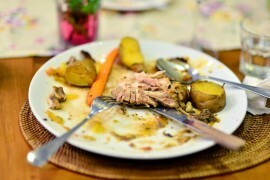 Steiner said that eliminating food wastage had “enormous potential” to reduce hunger and called on citizens to take individual action to tackle the issue. “Each one of us has a role to play. Starting with the ridiculous phenomenon in wealthy countries of not buying crooked vegetables any more,”he said, adding that over-zealous observation of sell-by dates was also leading to huge quantities of food being thrown away. High-income countries waste during the food consumption phase, while developing countries are losing food during production, the FAO said. The report fingered Asia in particular, saying that over 100 kilos (221 pounds) in vegetables per capita are wasted every year on average in “Industrialized Asia”, a region including China, Japan and South Korea. It estimated that the region also wastes 80 kilos of cereals – mainly rice – per person, warning that rice cultivation was also high-intensity in carbon and had emerged as “a significant environmental hotspot”. Wastage of vegetables in Asia occurred “during agricultural production, post-harvest handling and storage, and consumption phases,” the FAO said. Other key areas identified in the report in terms of waste and environmental impact were the meat industry in North America and Latin America, as well as fruit wastage in Asia, Europe and Latin America. Produced but uneaten food occupies 30 percent of the world’s farmland, the report said. “Food wastage reduction would not only avoid pressure on scarce natural resources but also decrease the need to raise food production”to meet the demands of a fast-growing world population, it said.